This card may have come up before but so very apt for this week! It seems that there is so much rush, fatigue and overwhelm at this time. What can you do to feel lighter? What can you do to feel lighter? Lightness can be a Guide throughout our journey. The lighter we feel, the more intuitive we become and the closer we are connected to our bodies and hearing our own inner wisdom. Lightness of emotions: let go of what is weighing you down and give yourself permission to be light hearted. Lightness of physical being: consume lighter foods, lighter texture, easy to digest. 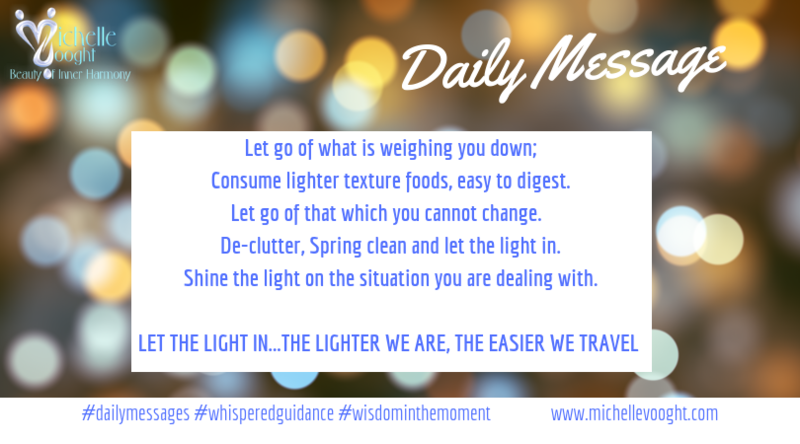 Lightness of the soul: cut cords, release the old, let go of that which you cannot change. Give yourself permission to walk free detached from judgement, indebtedness and guilt. Lightness of surrounding: as you feel the need to become lighter, so does the environment around you. Surround yourself with a lighter environment; de-clutter, Spring clean and let the light in. Allow the light to enter into your being and your existence; the lighter we are, the easier we travel. The easier we travel, the more we come to the understanding that there is a Higher Consciousness assigned to life, to purpose and that all unfolds as it should, in LIGHT.